The reset may be over, but business leaders hope that trade ties do not have to be completely dependent on the whims of Washington and Moscow. Russian Innovation Week, which has started today in Boston and would continue this week in Silicon Valley, is the latest attempt by entrepreneurs to show that bilateral trade and business cooperation between Russia and the United States does not have to be held hostage by the political climate. The conference, which is being held for the second time, is a showcase and networking event attended by hundreds of businesspeople, politicians and entrepreneurs from both the U.S. and Russia. This year’s meeting features several panels encouraging cross-cultural partnerships in the tech industry and investment by American firms in Russia. Currently, bilateral trade and investment between the U.S. and Russia is exceedingly low. Figures from investment holding firm Finam show that trade with the United States made up just 3.9 percent of Russia’s total turnover in 2011, down from 4.3 percent in 2008. On the American side, figures from the Office of the U.S. Trade Representative show that Russia is currently the United States’ 20th largest goods trading partner. Imports from Russia make up less than 2 percent of total U.S. imports, and these are mainly oil and oil products. But businesspeople and politicians alike argue that it doesn’t have to be this way. According to Evgeny Savostyanov, vice president of the Moscow-based media holding company Sistema, there are historical examples for good business relations even when political tensions were high. U.S. and Russian tech company representatives have a particularly positive outlook on the prospects for increased trade. Said Anatoly Karachinsky, president of Russian tech holding I.B.S., “In the tech sector, everything is going great. Our company is preparing an I.P.O. on the New York Stock Exchange. We’re working with leading U.S. companies like Boeing, Citibank and Ford on everything from credit systems to building the car of the future. I have only good things to say about our work in America.” I.B.S. is following in the footsteps of other Russian tech firms that have I.P.O.-ed in New York, including search giant Yandex and e-payment operator Qiwi. At the St. Petersburg International Economic Forum this summer, Cisco C.E.O. John Chambers called the high-tech industry “a politically neutral sector.” His firm is expanding its presence in Russia, where it has an R&D facility at the Skolkovo Innovation Center outside Moscow. 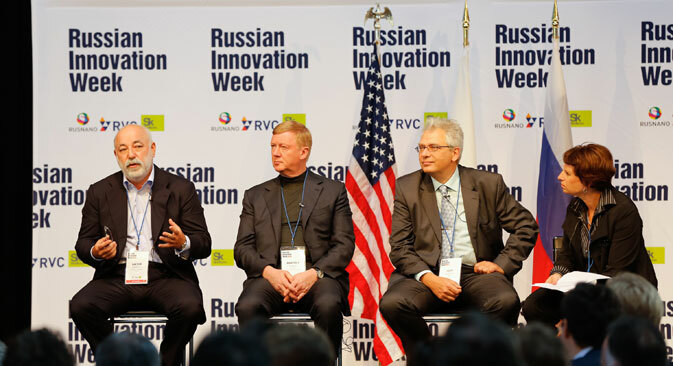 Mats Nordland, vice president of research programs at the Skolkovo Institute of Science and Technology, who spoke at Russian Innovation Week, is sure that cooperation between the U.S. and Russia can drive development. “Research thrives on diversity, different perspectives and different approaches. It is precisely for this reason that Russia, with its strong science traditions, and the U.S., with its innovation excellence, would both benefit tremendously from collaboration in the search for new knowledge and applications,” Nordland said. cooperation,” as McFaul wrote on his blog describing the series. McFaul hopes to continue to use his position to facilitate connections between Russians and Americans, entrepreneurs and officials working in the tech sector. One of the latest examples in U.S.-Russia tech cooperation is the Skolkovo Institute of Science and Technology, which opened the doors of its temporary Moscow campus to students for the first time on Sept. 2.
science and tech institions, is being created by the Skolkovo Foundation in collaboration with the Massachusettes Institute of Technology (M.I.T.). The university accepted its first class in the 2012–13 school year, but since its campus is currently under construction in the Moscow suburbs, this group of students spent last year studying at M.I.T., Imperial College London, E.T.H. Zurich in Switzerland and H.K.U.S.T. in Hong Kong.